This article is for curious but unscientific readers. Expert readers will find a description of the planned protocol within the NanoStress consortium here. For 2 years, we have announced everywhere that to obtain our Proof of Efficacy will mark the end of the phase of Research and the entry into the phase of Development, with as objective of a human prototype. 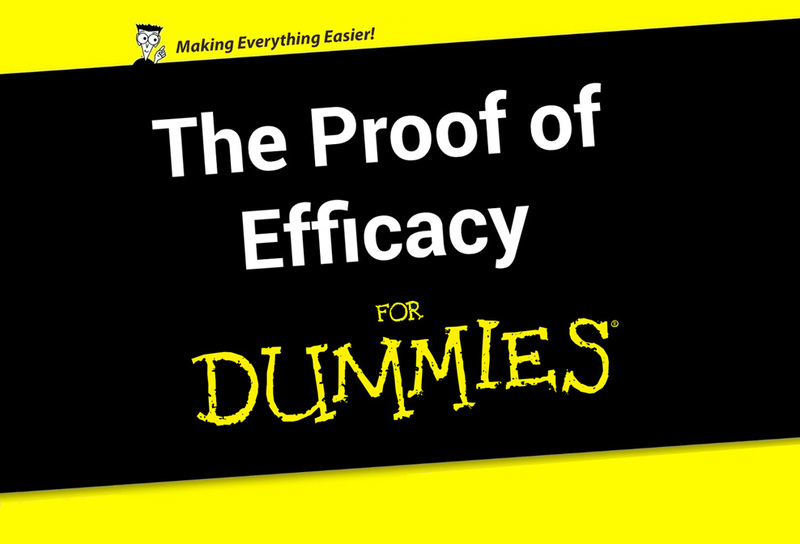 But what exactly is a Proof of Efficacy? Proof of Concept, Efficacy, Prototype, what are we talking about? In the field of innovation management, definitions of terms vary according to nationalities, field of research, institutions, and even authors. We had to forge our own vocabulary to describe the progress of our work. A Proof of Concept is a practical and preliminary experimental realization, short or incomplete, illustrating a certain method or an idea to demonstrate its feasibility. Our Proof of Concept experimentation was carried out in 2013, and after long, but fruitful, reviews with our reviewers, published in 2016. The experimentation validated the technical feasibility of our method, the action of a stress field on a tumor, obtaining a significant reduction of tumor growth. But we have experimentally validated none of our two therapeutic objectives, neither the decrease of the volume of the tumor, nor the reversion. Recall that reversion, that is to say the transition of cancerous tissue from malignant to benign, thanks to the action of a stress field has been obtained repeatedly in cell culture in vitro (for example here, or here), but never in vivo in mice. It would therefore be a truly remarkable scientific result.So, is the coming experience a second proof of concept? 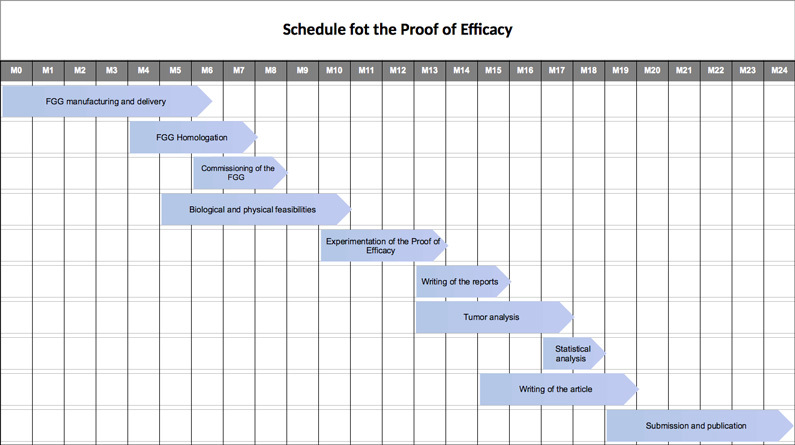 We prefer to say, “Proof of Efficacy”, a term seldom used that way. In medicine, efficacy is the measurement by objective criteria of the benefit for the patient of the application of a therapeutic method (which can be for example a drug, a medical device, or a health policy). The efficacity of a new intervention is often measured against an already known intervention. In oncology, the action of a new molecule will be compared whereas to an already known molecule, by measuring the size of tumors, survival, the rate of relapse, the occurrence of side effects. It is a therapeutic-oriented notion whereas Proof of Concept only seeks to prove that an experimental model of an innovation can become a viable innovation on a larger scale. However, future experimentation must prove, with the best possible experimental model, that our method can treat pancreatic cancer, with the transition to the human being as the next step. Contrary to the Proof of Concept, we are therefore on a very accomplished, complete experiment and very clearly directed towards care, including the construction of an animal prototype which already foreshadows the human prototype. Note also that we will take advantage of this experimentation to carry out preliminary feasibility studies: dose variation of injected nanoparticles, variation of field gradient exposure time, frequency, intensity, field orientation, in order to confirm the absence of toxicity and evaluate the best dosing. In summary, Proof of Concept has validated the main lines of our technical device. The Proof of Efficacy must confirm that a stress field is an effective therapeutic agent against cancer. How is it going to happen for real in animals? Experiments are conducted according to good practices and ethical rules in the use of human tumors, and in the respect of the maximum welfare of animals. Beforehand, the biological and physical feasibility will be done on a batch of thirty mice, to determine on the one hand the dose of nanoparticles, the vehicle of the nanoparticles (NP with ligand or liposomes with ligand), and the stability of nanoparticles; and on the other hand the intensity and the magnetic field gradient exposure time that the animals stand for. Depending on the results, readjustment of the experimental protocol will occur. These last two groups will provide a first study on the toxicity of the two devices: nanoparticles on one side and field gradient on the other. It is possible to have only one mouse at a time in the field gradient generator (GGC) prototype as designed. The expected exposure time is 1 hour per day, 5 days a week, for two weeks. Therefore, including animal handling time, only 6 mice can be treated every two weeks; it takes 12 weeks to treat 36 mice (treated group and control group” without nanoparticles, with gradient”). Field gradient exposure is under anesthesia. This series treatment makes it possible to compensate for any excess mortality, and to reorient the protocol in the event of error (obvious overdose, for example). In all animals, the tumor volume is measured 3 times a week by ultrasound, and once a week by radiography. In both gradient groups, 6 animals from the treated group and 4 animals from the control group will be sacrificed after one week to collect the tumor, measure the volume, and estimate the amount of iron around the tumor. Surviving animals are sacrificed after two weeks of treatment. On all dead animals, the tumor is removed, preserved either by freezing or by formalin, and sent to the pathology laboratory. The analysis will focus on the volume of the tumor, the search for a reversion (by measuring the fractal coefficient of tissue), or important apoptosis and the dosage of iron and its evolution over time. All results are reported in a database and subjected to statistical analysis with comparison between the different groups. The main objectives of the experiment are obviously to obtain in the treated group a decrease of the tumoral volume and / or a passage of the malignant tumor towards a benign phenotype. At the end of the experiment, we will proceed to the writing of various reports: quality assurance, experimental report, statistical report, and this, before embarking on the writing of scientific articles, proposed to high – level scientific journals, and submitted to the rereading of their scientific committee. After the experiment, the analysis of the samples will take a month of pathologist time (spreaded over 4 Months), 15 days of statistical analysis (ad hoc provider), and a month of writing the first version of the article (spreaded over 4 months). Submissions, proofreading and rewriting can be quite lengthy on such a fairly innovative subject and scarce reviewers (between 6 and 12 Months). This brings to a total of 19 months between the beginning of the experiment and the first writing of the article, the publication time being quite unpredictable and not easily manageable. This schedule does not take into account the previous step of manufacturing and installing the GGC, knowing that the plans are drawn and the contractor responsible for building already found; The whole process will take 8 Months, which can overlap with the first feasibility on nanoparticles. A total duration of the project can therefore be estimated at 2 years. We can estimate a minimum budget according to the indications given above, knowing that through partnerships with public research laboratories, certain costs are borne by the partner(s), especially the experimental premises, or the providing of tumor grafts; at the same time, this partner will impose other expenses, including payrolls. The public funds provider also imposes other restrictions, for example in terms of communication, drafting of interim reports. This budget is therefore indicative, but the final budget will probably be different, either in total or in terms of the actual share of CC & C.